The pursuit of science in Antarctica has always been a human and logistical challenge. Not many fields of research are as dependent on a combination of environmental conditions, human ingenuity, and logistics. There is no easy way to get to Antarctica, and ice - which defines the continent - remains its strongest rampart. 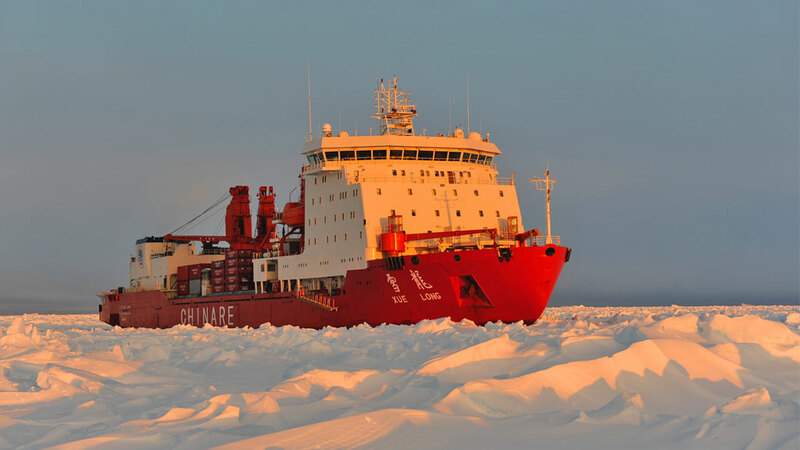 As I write this, the Xue Long remains stuck in sea ice, moving forward toward Zhongshan Station at the painfully slow speed of some 200 to 300 metres a day! Time seems to have come to a standstill for both passengers and crew. Luckily there is ping pong and karaoke! Five days ago, arriving in Antarctica very early in the austral summer (see previous article), we struck a band of very hard sea ice 58 kilometres from the station, with no option but to break our own passage. Trying various ice-breaking techniques, we covered some 18 kilometres in the first 48 hours, but then encountered what Captain Wang Jianzhong calls an "ice-ridge," or band of compacted sea ice that can be five metres thick or more, and with which we are still battling. It can also be hundreds of metres wide (as is the case here) and occurs where two plates of sea ice have collided and crushed against each other - in this instance, multi-year fast-ice (attached to the edge of the continent) and pack sea ice (or ice that forms and drifts with the currents offshore). In many ways, it represents the nightmare scenario as it is too broken for the safe unloading and transportation of cargo, and (theoretically) too thick to let us through. In these circumstances, it's a wonder that we are making any progress at all, but by sailing the Xue Long back and forth, little by little, the captain is managing to open up a channel three times the width of the ship and sufficiently ice-free to sail through. The aim, and necessity, is to get the vessel beyond the ice-ridge to the secure fast-ice where the unloading can take place. At this point, I should explain that the Xue Long's theoretical 1.2 metre ice-breaking ability is defined not by its structural strength (the Xue Long's hull is up to 30cm thick at the bow), but by engine power. When built in Ukraine in 1993, the Xue Long was one of eight sister ships designed to be able to accommodate a range of engines. And whereas it is classified as an A2 class ice-breaker, some of its sister ships are classified as A1, because they are driven by more powerful engines. Once we get through the ice-ridge, which hopefully will be in the next 24 hours, we will be able to start the unloading process. At that point, the Xue Long will be three to four days behind schedule and almost exactly 40 kilometres from Zhongshan Station (at the upper-limit of the 20 to 40 kilometres hoped for by the expedition leaders). This will mean doubling efforts for the unloading and transport crews. The logistics of what will be airlifted and what will be pulled by snow tractors is still being worked out, but in order to save time, the unloading of lighter goods is already underway by helicopter, and some thirty personnel have been flown to Zhongshan to prepare as much as they can for the Dome A traverse (given that most of their cargo is still sitting on board the ship). Once we get through the ice-ridge, which hopefully will be in the next 24 hours, we will be able to start the unloading process.